Knitting Novices: Have You Finished Your Homework? My question concerns the left and right edges. I've noticed that on my swatches the edges sometimes look rather ragged. Do you have any hints/tips that I can use to keep them neat and tidy? Thanks so much! The secret to tidy edges is...after you do the first stitch on a row, stop and push/pull all the "collar" of the stitch around to the back of the stitch - at the same time, pull as much slack out of the yarn as you can, You should be able to pull at least an inch of yarn out of the stitch. Please add me to the knit-along. You will be picking up stitches on both edges to do your collar - ribbing or whatever so one full stitch will disappear under the edge treatment. My question is about a modification I'd like to make in the pattern. 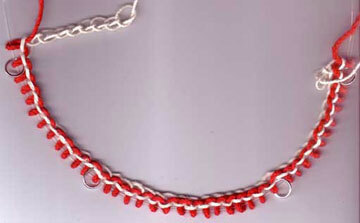 I would like the sleeves to have a slight bell shape rather than a taper to the wrist. Can I do that by changing needle sizes? Or if I just don't decrease, will they come out way too wide? Thanks for your help, and for inspiring me to try my first sweater! I have finished the Summer Cardigan in Cotton Twist, except for the right front buttonhole band. I worked on it a good amount of time while on vacation last week. I did not have the directions with me for sewn cast off, so had circular needles hanging out everywhere. I got the pattern for a long sleeved cardi today, and am thinking of making it. Carrie - If you make the sleeves wider by using larger needles, you risk have fabric that is loose or sloppy. Better to taper the sleeve down to a point where you want the bell to start and then increase at 4 - 8 points. Work one row even after every increase row. Looking for help on the provisional cast on, I found the video on this page, which seems like it could be more straightforward than the crochet method: http://www.knittinghelp.com/knitting/basic_techniques/ (scroll down to see the provisonal). I don't know how to crochet at all, so I wasn't really getting it right. Is there any reason why the video method wouldn't work for what we're doing here? I followed the pattern instructions for casting on for the underarm stitches, but wondered afterwards if these, too, could have been done with the provisional cast-on. Would that have worked? 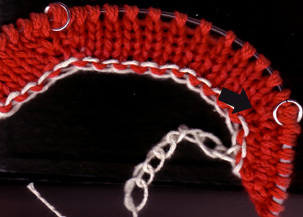 Yes - if you use a provision cast on for the underarms, you will not get a ridge there when you join them together. It will make the underarm area more stretchy.